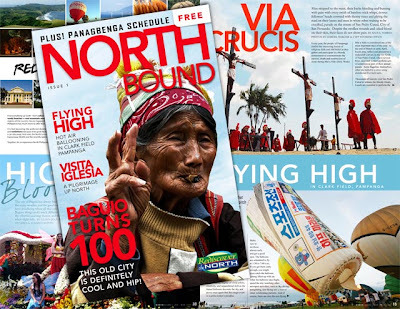 Northbound Magazine, your free travel guide to North Philippines! After several months in the making, the maiden issue of Northbound Magazine, a free quarterly travel guide to North Philippines (Ilocos Region, Cagayan Valley, the Cordilleras and Central Luzon), will be available in hotels, restaurants and information centers around the region beginning next week. This magazine is a publication of the North Philippines Visitors Bureau. You can download the online version from www.northphilippines.org. that's a gorgeous cover shot! Great photos, writing and layout! I want in on this. Hehehe. I will promote this with my colleagues. Plus the downloadable for FREE...Nice Touch!!! Thanks Teddy! We needed something sustainable with the funds allotted, not a one-time deal. Plus we wanted to make sure the lay-out was up to our standards. We're very happy with the finished product. To the bitter guy who said we copied his idea, you don't have the monopoly of ideas. This is the first free guide for North Philippines. So which did we copy? Besides, is coming out with a free magazine your right and yours alone? This is a free market where people look for the best products. If you had a good product to begin with, we could have said yes to your proposal. The magazine was in the pipeline even before you approached us. Besides, we're doing this to promote North Philippines. If you are really doing what you're doing for the benefit of Philippine tourism, you should be happy that other people are doing their share. Unless you're simply in it for the money and are bitter because we suddenly became competition in your eyes. I believe that the more travel guides on the Philippines, the better. unable to download the magazine =( there seems to be a problem with the link? Thanks for coming up with this free travel guide. I first saw a copy of your mag when our family stayed at Montemar Beach, Bataan in summer 2009 but it was not supposed to be taken out of the room. Since then, I always asked around everytime we go north until I came upon your Issue 5 given free at Mountain Woods Subic last Sat., May 8, 2010. More power and hope you also include suggestions for overnight accomodations with corresponding room rates and reviews in your next issues. hi ivan really love ur magazine super informative for persons like me and my husband who like to travel. i wonder if we can subscribe or even pay for the shipping fee just to have a copy. We're from the south and we hardly go to northern provinces. Thats why all of our road trip and vacations are mostly in the south. More power and hope u give me the easiest way to have ur magazine.